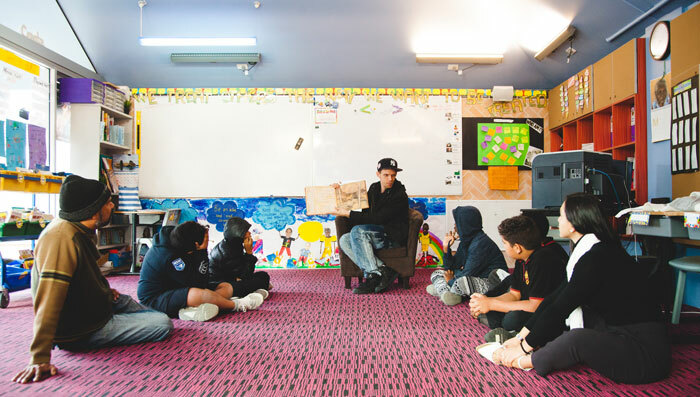 Since 2014, STC Ed and Redfern Jarjum College have collaborated on School Drama, STC’s teacher professional learning program that brings STC Teaching Artists into primary classrooms. Redfern Jarjum College is a primary school for Aboriginal and Torres Strait Islander children, working in partnership with the Redfern Aboriginal community to educate and support children who find mainstream primary schools challenging. In 2014, City of Sydney funding enabled STC to deliver the School Drama program at Redfern Jarjum College without any charge to the school. In 2016, further support from City of Sydney allowed STC to continue this partnership. Lina Gonzalez, classroom teacher, commented, "It’s easy to witness how engaged the students all are. It’s actually helped improve how they express their feelings and emotions and just to be able to communicate at a different level. Particularly some of the students we have who find it really hard to express emotions. It just feels like the program works perfectly for that. They’re always engaged." After Lina’s positive experience with the program in 2016, the other classroom teachers were keen to participate in the program as well. Thanks to additional funding from STC Foundation, all teachers at Redfern Jarjum College participated in the program in Term 2, 2017. While School Drama has been proven to improve student literacy and confidence, the primary focus of the program is to build the capacity of teachers to use drama in the classroom after the STC Teaching Artist has left. According to Lina, she has been able to link the School Drama workshops with activities and content in other class time. "The growth and confidence that you gain as a teacher and having someone alongside to guide you through that is really good," said Lina. "Even when the Teaching Artist isn’t here, I try to incorporate some of the strategies into my lessons." 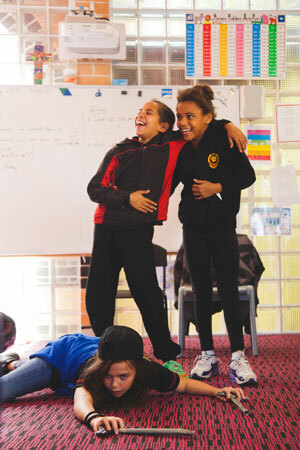 An added benefit of implementing School Drama at a school like Redfern Jarjum College is that the outcomes extend beyond teacher capacity and student literacy. According to Principal Frances McCarthy, "It was extraordinary how Felix [one of STC's Teaching Artists] was challenging the students to be empathetic and engaged in how other people are thinking. A core part of our behaviour management strategy is developing empathy, compassion and understanding for other people. It’s that kind of expressive language that they are really missing." After seeing School Drama in action in the classroom, Frances has requested that STC return for another term of the program, building on the trust that’s been established between the STC Teaching Artist, teachers and students. We have been able to secure support from STC Foundation to fund the continuation of the program in Term 3, 2017. Overcoming barriers to access STC programs and performances is a core focus for STC Ed, and Redfern Jarjum College is one of many schools who received extra subsidies in 2017. "For us to be able to have access to this kind of creativity is just extraordinary," says Frances.